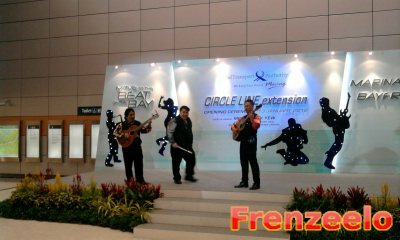 Previously, I talked about the opening of the new stages of the Circle MRT Line which was Stage 4 and 5 from Caldecott Station to HarbourFront Station. You can check it out here. 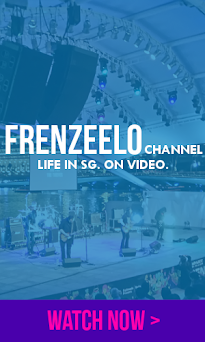 Now, I'll be talking about the opening of two new stations which are Bayfront Station and Marina Bay Station also known as the Circle Line extension. So let's get to it! 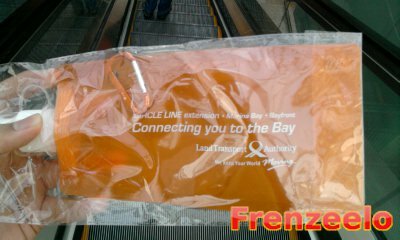 The new Circle Line Extension which started operations on the 14th of January 2012 brings people to the door step of the Marina Bay Sands Integrated Resort. Back then, visitors would have to take the MRT to Promenade Station and walk all the way to the resorts. With this new extension, passengers can simply board the train to Bayfront. 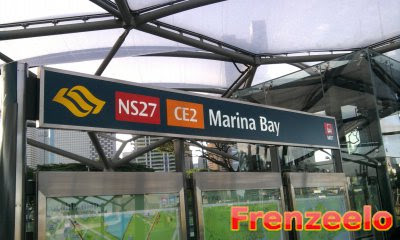 Also, people who wanna go to the Marina Barrage or the Marina Bay Financial Centre can take the Circle Line to Marina Bay station which interchanges with the existing North South Line. The open house was held on the 13th of January, the day before the extension opened. Getting there was simple. 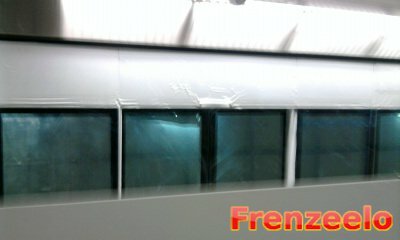 I took the MRT all the way to Marina Bay Station on the North South Line. Once I was there, the open house just started, (well actually I came in about 20 minutes later) got my free gift and started watching the free performances at the station. Just like the Circle Line open houses of past, there were interim events, performances, gifts and free train rides. The public was invited so I took the chance and visited the open house. This was my free gift. It's this weird looking water bottle that's flexible and made of plastic. On the bottle, the message was "Connecting you to the Bay" referring to the locations of the new MRT stations which are located near Marina Bay. Even though I got this, I didn't really use it and it's in my drawer collecting dust. Still, it's great that they gave away free stuff during the open house. 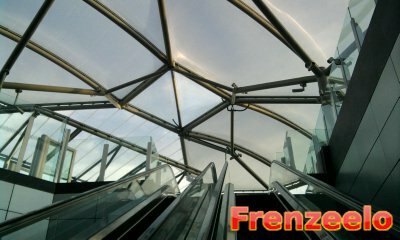 One of the new Circle Line stations, Marina Bay Station has this very interesting architecture. 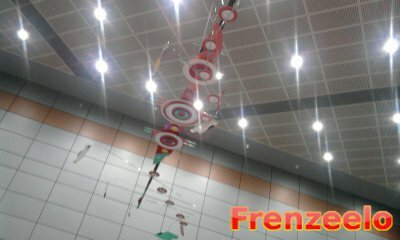 They ceiling look like bubbles and it's semi transparent unlike typical MRT Station designs. Doesn't that look awesome? It sure does to me. Getting to Marina Bay is simpler now but the land surrounding the station is still largely undeveloped. The nearest building, Marina Bay Financial Centre is still far away. The Marina Barrage (article here) is also quite far away even though the nearest MRT station is Marina Bay. Hopefully in the next few years, the land will be more utilised and developed. 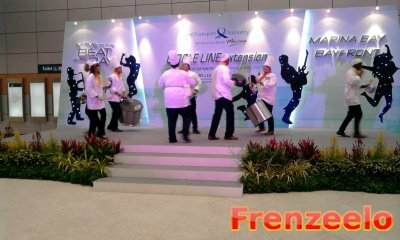 Some of the live performances include a bunch of people dressing up as chefs and hitting pots and pans to create music. The music was well performed and it didn't feel like it was noisy. They even came out of the stage and walked around near the spectators and performed at the same time. How cool is that? The next performance was this band with three people performing some Spanish or Mexican related songs. 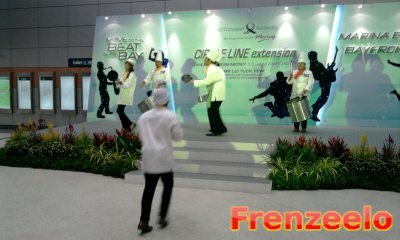 I believe these people were also the roving performers at the nearby Marina Bay Sands Integrated Resorts. Their music was great and it's more traditional-sounding. The last performance that I watched was of this two people performing with an accordion and some kind of drum. Overall, the performances may not be as top-notch as others but still, they were entertaining and really captured quite a lot of attention. 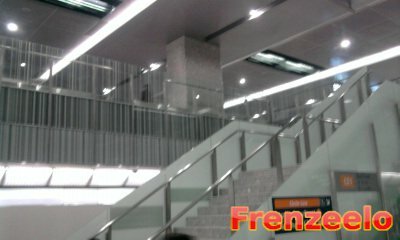 Here are some interior shots of the Marina Bay Circle Line station. Notice at the platform, the escalators were actually going downwards instead of upwards. Well, the platform was actually built higher than the concourse level which was not unusual for above ground stations but it is for underground stations. 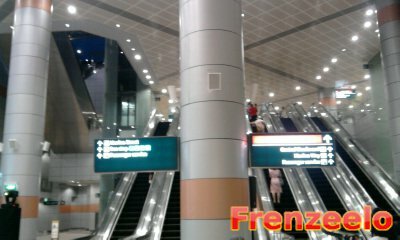 The escalators led to the transfer platform to the North South Line as seen from the picture above. 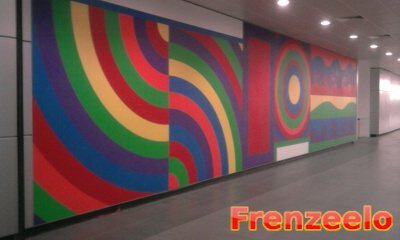 The station also has this interesting artwork found at the ceiling. Very neat indeed. 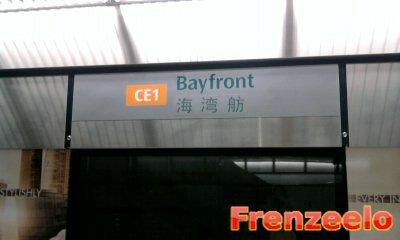 Now let's move on to the next station on the Circle Line extension which is Bayfront Station. 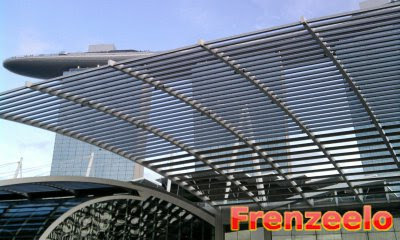 Bayfront MRT Station is located directly underneath the Marina Bay Sands Integrated Resorts. 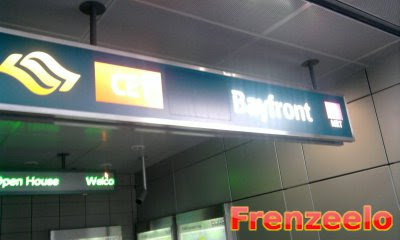 Bayfront Station also links passengers to the upcoming Gardens By The Bay (check out a sneak preview here). 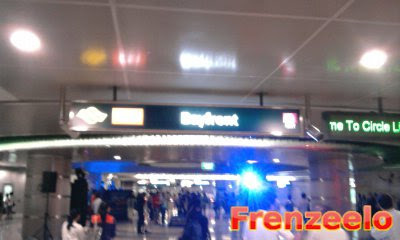 Above, the signboard at the station's entrance looks a bit unusual don't you think? Why is there a big spacing in the middle? Well, they actually covered a station code which is DT16 with a sticker. So it's supposed to look like "CE1 DT16 Bayfront". Bayfront Station is also an interchange station which connects with the upcoming Downtown Line which will connect the Bukit Timah and Kaki Bukit residents to the city easily. So they'll peel off the sticker when it opens. Like what I said earlier, Bayfront links directly to the beautiful Marina Bay Sands Integrated Resorts as seen from above. Oh and I forgot to mention that the trains rides were indeed free. 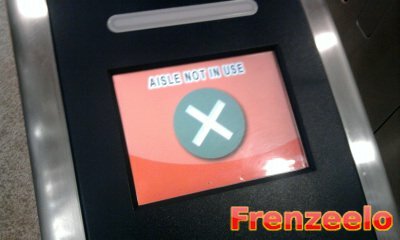 Like I said in my previous post, I will take pictures of the MRT fare gates whenever there is an open house. 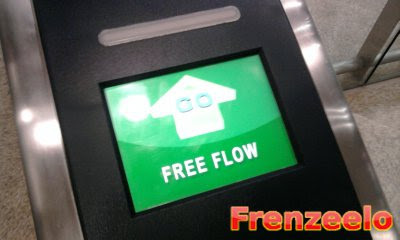 It's weird that the LCD display said 'Free Flow' which may refer to the free flow of drinks. They should've changed the words to Free Entry instead. 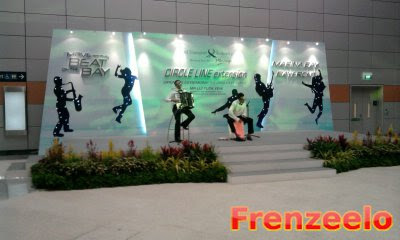 Just like at Marina Bay Station, there were also roving performances and station artworks as seen from above. 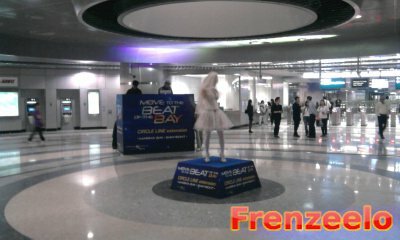 At the main station concourse, there were these 'platforms' that performers stood on and danced to the beat of the music. The performers wore whacky outfits and they dressed up as Elvis, Lady Gaga and also a Bride at a wedding. The performances were indeed awesome. 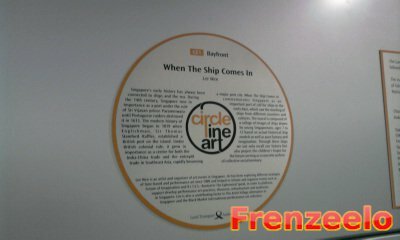 The station's artwork is titled 'When The Ship Comes In". You can check it out at the station itself for a close up view of the artwork. The artwork looks like it has something to do with its location by the Bay. Here are some shots of the platform. 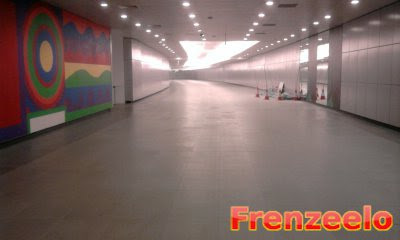 Looks like a typical MRT platform and the layout seem to look exactly like Promenade station. Also, notice that there's this platform that's been hoarded up? Well, that platform is actually for the upcoming Downtown Line which I've just mentioned. 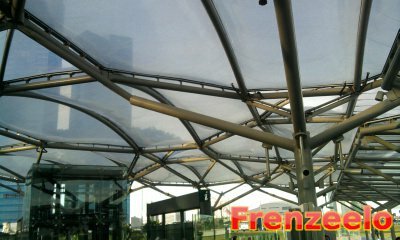 Once it's opened, you can go to other places like Bugis, Chinatown or Bukit Panjang. Also at Bayfront Station is this linkway which leads to nowhere. As of 13 March, the linkway was closed to the public. I believe it's the linkway that leads directly to Gardens By The Bay. 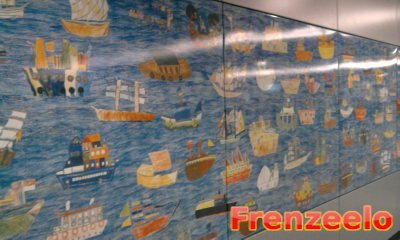 There's also this interesting piece of multi-coloured artwork which can also be found at the lobby of the Marina Bay Sands Hotel. Remember the performer that I mentioned that wore a Bbide's dress? Here's the picture of it. Looks hot, don't you think? Overall, the stations were nice and well-designed. The Open House was indeed fun also. 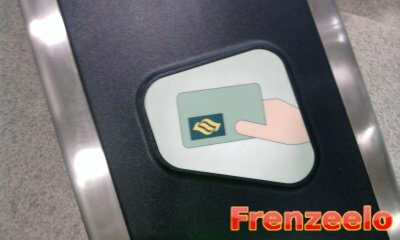 If you want to get to Marina Bay and the Integrated Resorts, these stations will definitely bring you there conveniently. 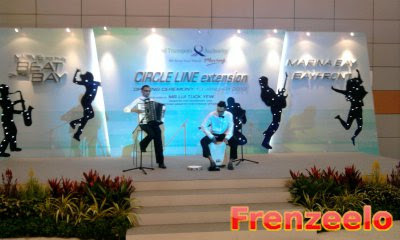 There will be no more open houses for the Circle Line as every station on the line has been opened for business. Do take note that if you want to get to Bayfront or Marina Bay, you need to alight at either Stadium, Nicoll Highway or Promenade stations and wait for the next train during non-peak hours. 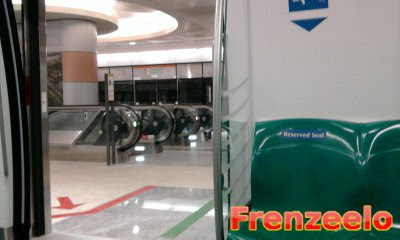 During peak hours, you need to wait for the train that terminates at Marina Bay. So you need to check the TV screen at the station you're boarding from for the terminating station of the train. Sounds confusing? You'll get used to it if you know how. You can anytime ask the station staff for help. لا أحد يختلف على أنه يوجد عدد كبير من شركات التنظيف لكن لا يسعك بالطبع وضع ثقتك في جميعها لذلك ننصحك بضرورة التواصل مع شركة تنظيف بيوت العين إذا وجدت صعوبة في تنظيف منزلك وستجد لدينا كل ما ترغب فيه وتسعى للوصول إليه من أهداف حيث أننا نعمل جاهدين على تحقيق أفضل النتائج التي من شأنها الحصول على استحسان جميع عملائنا الكرام في أقل وقت وبأقل تكلفة فلا داعي للتفكير طويلا في الأمر بل اتصل بنا الآن. إذا كان هناك بعض البقع الصعبة على المفروشات فنحن لدينا أقوى أنواع المواد المنظفة التي تساهم بشكل كبير في إزالة أصعب البقع مع الحفاظ على الألوان ورونقها. نعمل على تنظيف المطابخ بكل محتوياتها بأحدث التقنيات حيث يمكننا تنظيف البوتاجازات وإعادتها إلى هيئتها الأولى وكذلك تنظيف الثلاجات والشفاطات والمراوح وأجهزة التكييف والأفران بكل أنواعها وأحجامها. هل تعبت من غسيل السجاد وتنظيفه؟ إذا فلماذا ترهقين نفسك في مثل تلك الأمور وأنت لديك الحل الأمثل لكل المشكلات التي يعاني منها السجاد الموجود في بيتك ألا وهو الاعتماد على فريق عمل شركات تنظيف السجاد في العين في تنظيف جميع السجاد والموكيت الذي تقتنيه مع العلم بأنك ستدفعين مبالغ زهيدة مقابل تلك الخدمات المتميزة.